There are droughts in all sports and the LA Kings just recently ended their 45-year dry spell by winning the franchises' first Stanley Cup Championship on June 11, 2012 defeating the New Jersey Devils in six games. Because of Major League Baseball's long history, there are droughts that reach the 100-year mark or last many decades. The Chicago Cubs championship drought currently stands at 103-years with their last title occurring in 1908. The Cubs are 5-5 in the last 10 games. At 42-58 they don't appear to be in a position to end this championship skid. Chicago trails division leading Cincinnati by 18.5 games in the National League Central Division. The other two long droughts in baseball occurred when crosstown rival, the Chicago White Sox won their first title in 87-years as they captured the 2005 World Series. A year-earlier, the Boston Red Sox ended the curse of Babe Ruth (The Bambino) by snapping an 85-year drought in 2004. The Cubs hired Red Sox General Manager Theo Epstein this winter hoping to have the same fortune that gave Fenway Park a championship atmosphere that will transfer to Wrigley Field. Droughts don't only have to be just championships. The 2012 season has produced a pair of great pitching performances. Johan Santana pitched the New York Mets first no-hitter with an 8-0 victory on June 1 over the defending World Series Champions St. Louis Cardinals at Citi Field. The Mets went 8,020 games without a no-hitter and previously threw 35-one hitters. Their first no-hitter in their 50-years of baseball leaves the San Diego Padres as the only team left in MLB History to have not thrown a no-hitter. During this span, Nolan Ryan, Tom Seaver and Dwight Gooden were unable to perform this for the Mets. Twelve days later, another former New York based team made history at AT&T Park in San Francisco on June 13, 2012. Matt Cain threw the 22nd perfect game in MLB History by striking out 14 Houston Astros in a 10-0 triumph for the San Francisco Giants. His 14 strikeouts tied an MLB mark with former Los Angles Dodger Sandy Koufax in 1965. More importantly, this was the first perfect game in the 129-year history of the Giants franchise. As former Los Angeles Dodgers Manager Tom Lasorda once told me, "Because God Delays Doesn't Mean That God Denies." I'll be curious to see what drought ends next. They are definitely historical when they happen especially in "The Great American Pastime." With MLB's non-waiver trading deadline of July 31 approaching, teams are bolstering their rosters for a shot at winning the World Series. During the off-season, Baseball Commissioner Bud Selig got his wish by adding another wild-card team that will play a play one game play-in contest for the right to continue in the post-season. There can never be too much excitement in October. Currently, eight teams are in the hunt for the final two wild-card spots ensuring more fans will be glued to their TV's into September. This will only enhance our opportunity to see an unlikely champion. Lets not forget, the NFL had a 9-7 New York Giants squad win the Super Bowl early this year. If this format was in place a year ago, the Atlanta Braves and Boston Red Sox wouldn't be agonizing over their late-season collapses. More importantly, former Red Sox Manager Terry Francona could still be the pilot in Beantown. The expanded playoff format has accomplished one major development thus far. Teams are holding out longer to see if they can indeed reach the post-season as excitement and intrigue expands to more towns. With that said, I've decided to compile 20 of the most intriguing match-ups that we could see in "The Fall Classic." The New York Yankees are always a popular choice in October because of their storied tradition. My list is going to take many interesting things into consideration and I welcome your feedback. 1) Washington Nationals vs Texas Rangers. The Washington Senators moved to Texas and became the Rangers in 1972. Who knows whether Stephen Strasburg will be pitching in this series because he could be shut down for the season, but there is a lot of bad blood between these two metro areas with the Washington Redskins--Dallas Cowboys rivalry. 2) Oakland A's vs Pittsburgh Pirates. Both franchises are small market teams with low payrolls and this season are feel good stories. They've won their fair share of World Series titles in the past with a lot of Hall of Fame players. Oakland has won nine titles while the Pirates have amassed five. Oakland has had Reggie Jackson, Catfish Hunter, Rollie Fingers while Willie Stargell, Roberto Clemente and Dave Parker have championship rings. There are a lot of no-name players on both teams now. They'll be known if they reach the World Series, The Raiders and Steelers represent what these teams stand for on the gridiron. The Pirates are trying to snap a 19-year losing season streak. Their last World Series title was in 1979 while the A's won in 1989. 3) St. Louis Cardinals vs Los Angeles Angels. The Albert Pujols Bowl. Need I say more? 4) New York Yankees vs San Francisco Giants. I wasn't alive when these teams played their version of the Subway Series in the 1950's. Based on large attendance during inter-league play, the former New York Giants, once the home for Hall of Fame Outfielder Willie Mays, would be a great coast to coast draw for the nation and the baseball traditionalists would be thrilled to see this match-up. We'll call this the "Back To The Future Match-Up." No Yankee Stadium I or the Polo Grounds, but no one will care. The Yankees defeated the San Francisco Giants 4-3 in the 1962 World Series. It was Yankee Stadium I vs Candlestick Park. 5) Pittsburgh Pirates vs New York Yankees. These two teams met in 1960 and the Pirates defeated the Yankees 4-3. The Hall of Fame players included Pittsburgh's Bill Mazeroski and Roberto Clemente. For New York, Manager Casey Stengel, Yogi Berra, Whitey Ford and Mickey Mantle. The major story line for this potential series is that New York traded pitcher AJ Burnett to the Pirates on February 18th for two minor leaguers. The Yankees are paying $20 million of the $33 million owed on Burnett's contract. He his 12-3 with a 3.52 ERA. If Burnett were to get revenge against New York, it would be one expensive Yankees backfired trade. 6) Chicago White Sox vs St. Louis Cardinals. These two teams have a unique connection. The Chicago Cardinals of the NFL shared the same stadium as the White Sox from 1922-1925 and 1929-1958 playing in Comiskey Park I. The Chicago Cardinals then moved to St. Louis and shared Busch Stadium with the Baseball Cardinals then made their final move to Arizona,. 7) Oakland A's vs San Francisco Giants. Oakland swept their Bay Area rival 4-0 in the Earthquake Series in 1989. The A's appear to be headed to San Jose in the next few years so it would be neat to see a rematch of the Battle of The Bay without the drama of another earthquake. 8) Los Angeles Angels vs Los Angeles Dodgers. Both NHL teams have won Stanley Cups speaking of the Anaheim Ducks and Los Angeles Kings. Now it's time to get their baseball teams on the same field in the World Series in The Freeway Series. Former Dodgers Catcher Mike Scioscia won two World Series Championships as the team's catcher in 1981 and 1988. In 2002, he won the Angels lone title defeating the San Francisco Giants 4-3 and prevented Barry Bonds from winning a ring. These local match-ups are fun to watch and this would involve the No.2 TV Market in the USA. 9) New York Yankees vs St. Louis Cardinals. These two teams have met in the World Series five times with St. Louis winning three. The Yankees have the most World Series appearances with 40 while St. Louis is tied with three other teams at 18. The Yankees have won the most World Series Titles with 27 and the Cardinals are second with 11. The great players in this rivalry include Babe Ruth, Lou Gehrig, Lefty Gomez, Bill Dickey, Phil Rizzuto, Joe DiMaggio, Whitey Ford, Mickey Mantle and Roger Maris. For St. Louis, there is Rogers Hornsby, Stan Musial, Enos Slaughter, Bob Gibson, Lou Brock, Tim McCarver and Hall of Fame Broadcaster Bob Uecker was the back-up catcher for the Cardinals. 10) New York Yankees vs Washington Nationals. These two teams met from June 15-17 and New York swept the series 3-0 in Washington D.C. But the Nationals were winners at the Box Office drawing crowds of 41,406, 41,287 and 41,442. These two squads could double the attendance if the stadium was larger. Washington ace Stephen Strasburg was 8-1 at the time and didn't even pitch in this series. Bryce Harper has become an All-Star while the Yankees are simply the best team in baseball. If they meet in the World Series, look for a much closer outcome. Washington Manager Davey Johnson is an excellent skipper and whether Strasburg is available or not, it will still be a great series. The future looks bright for Washington. When people look at these two cities, they'll realize the story-lines will go beyond the New York Giants and Washington Redskins. 11) New York Yankees vs Los Angeles Dodgers. The Dodgers have new ownership and they're willing to spend money. The Dodgers also have former Yankees great Don Mattingly as their manager. Not that this series needs anymore hype. There were great match-ups with the Brooklyn Dodgers and Yankees in their Subway Series. The rivalry continued when the Dodgers moved to Southern California. When the top two TV Markets meet, it's always a ratings bonanza especially between these two storied franchises. Too many names to mention. 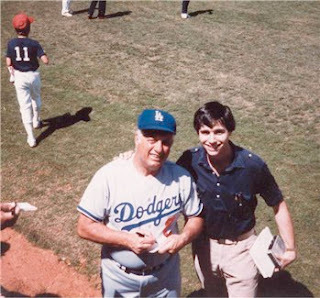 But Dodgers Manager Tom Lasorda gave me my first major interview when his team defeated the Yankees 4-2 in the 1981 World Series when we were at the Baseball Winter Meetings at the Diplomat Hotel in Hollywood, Florida. To date, that's one of the high points of my Journalism Career. 12) Texas Rangers vs St. Louis Cardinals. Anyone want a rematch of last year's classic match-up that went seven games? Rematches are always fun to watch. But Albert Pujols is gone, Tony LaRussa retired on top and the Rangers know they were just one strike away twice from their first championship after letting Game 6 slip away 10-9 in 11 innings. The Rangers have lost two straight World Series titles, falling to the San Francisco Giants in 2010. 13) Chicago White Sox vs Cincinnati Reds. My late Grandmother Sophie Morganroth wasn't alive for this match-up in 1919. The Reds defeated the White Sox 5-3 in an eight game series. 14) Los Angeles Dodgers vs Chicago White Sox. These teams share the same Spring Training Complex in Glendale, Arizona. In 1959, the Dodgers defeated the White Sox 4-2 in the World Series. 15) Arizona Diamondbacks vs New York Yankees. I was living in Arizona at the time when the Diamondbacks gave "The Valley Of The Sun" their first major sports championship defeating New York 4-3 in a classic series. I proudly wear My Diamondback Championship Golf Shirts as New Yorkers in South Florida cringe. The only people rooting for the Diamondbacks were us locals in Arizona and Boston Red Sox fans. Despite the sentimental feelings for New York City during the tragic events of September 11, 2001, us Arizonians relished the underdog role. During a celebration at the Stadium Club Sports Bar in Chandler, Arizona that caused me to break three small toes, it was still worth it. If they meet again, former Tigers Outfielder/ Arizona Manager Kirk Gibson and Shortstop/ Bench Coach Alan Trammell are on the Diamondbacks bench. I'll be pulling for them as well. 16) Detroit Tigers vs Los Angeles Dodgers. Not much history between these two teams. But Kirk Gibson hit a clutch World Series Home Run enabling the Tigers to defeat the San Diego Padres in 1984. Then in 1988 when he left the Tigers for the Dodgers, in his only at bat in Game 1, against the Oakland A's, he hit the game winning home run with legendary Hall of Fame Announcers Vin Scully and Jack Buck making memorable calls. Now former Michigan State and Los Angeles Lakers legend Magic Johnson is part owner. We know that Magic Johnson and the Detroit Pistons had a strong rivalry. 17) New York Yankees vs Cincinnati Reds. They are miles apart in payrolls but the Reds swept the Yankees 4-0 in 1976. Sparky Anderson won his second straight World Series defeating former Tigers Manager Billy Martin with the "Big Red Machine." The Reds have five World Series titles with the last one being in 1990. 18) Cincinnati Reds vs Detroit Tigers. These two teams are located four hours away on I-75. They met in the World Series once in 1940 with the Reds winning 4-3. From June 8-10, they met at the Cincinnati Riverfront and the Tigers won two of three games in a series where all three contests were decided by one run. Fox may not like this ratings match-up, but what better way to stir up tensions between two states where Michigan--Ohio State Football Rivalry is huge. The Tigers and the Reds have great traditions. I used to cover the Reds Class A Florida State League team the Tampa Tarpons for the Tampa Tribune in 1985 and 1986, plus worked for RedsVue Magazine in Cincinnati. 19) Chicago White Sox vs Atlanta Braves. I have to give future Hall of Fame Player Chipper Jones some love in his final season. The White Sox have been known to get hot at the right time and have low-keyed Skipper Robin Ventura leading the way. Could be a good match-up of two large media markets covering the South and the Midwest. I always like seeing a new match-up of teams that have never met in the World Series. 20) Detroit Tigers vs Atlanta Braves. In 1987, the Tigers traded a young prospect at the trading deadline named John Smoltz for veteran hurler Doyle Alexander. The trade produced a division title for the Tigers and a World Series Crown for the Braves in 1995. Smoltz is headed to the Hall of Fame. Detroit would trade Jair Jurrgens to the Braves and he's had a solid career. Former Tigers Executive the late Bill Lajoie also worked in the Braves front office. A Detroit vs Atlanta meeting is also another battle of I-75. Fox Sports will have plenty of time to wish for a ratings winner. It will be interesting to see how this plays out the next couple of months. As the NHL prepares for a potential lockout this fall, we must not forget what happened on June 11, 2012. The Los Angeles Kings completed their improbable ride through the Stanley Cup Playoffs winning their first NHL title since the team began play in 1967. LA's first championship in its 45-year history was a 6-1 rout of the New Jersey Devils. Over the years, I've seen teams in all sports reach the finals with records under .500, but these Los Angleles Kings made a different type of history. One must look deep into their regular season record of 40-27-15 with 95 points. They changed coaches and fired head coach Terry Murray, he was replaced by interim coach John Stevens, then on December 20, 2011, Darryl Sutter was named 24th head coach in franchise history. The NHL standings are wins, losses and overtime losses. In the real world, the Kings would be 40-42. But not for the sport that is played on a Frozen Pond. The Kings entered the playoffs third in their division behind first place Phoenix 42-27-13 with 97 points. San Jose was 43-29-10 with 96 points. The Kings earned their way to the Stanley Cup Finals with 10-straight road wins and 12 over two seasons which are both NHL records. LA's road winning streak ended as New Jersey defeated the Kings 2-1, on June 9, 2012. All it takes in Hockey is a hot goaltender and Jonathan Douglas Quick, who was born on January 21, 1986 was awarded the Conn Smythe Trophy as the Most Valuable Player during the 2012 Stanley Cup Playoffs. The 26-year old native of Milford, CT, has a regular season record of 131-87 and playoff mark of 20-12, including a 16-4 mark in this years post-season. This kid defeated No.1 seed Vancouver (51-22-9, 111), No.2 seed St.Louis (49-22-11, 109) and No.3 Phoenix, all of which were division winners. On June 28, 2012, Quick agreed in principal to a 10-year contract that will keep him in Southern California until the 2023 season. There is no way that I will ever down play this team's success. It's hard to believe that they were the final Winter Sports LA team standing since there were high hopes for their Staples Center neighbors the Lakers and Clippers. Los Angeles 4-2 series win against the Devils came against future Hall Of Fame Goaltender Martin Brodeur, who has led New Jersey to three Stanley Cup Titles. The Kings win over the Devils was the first time ever that an eighth seeded team in North American Professional Sports won a championship. Los Angeles was the second team in NHL history to beat the top three conference seeds in the playoffs. The 2004 Calgary Flames did it under Darryl Sutter, but LA was the first eigtth seeded team to accomplish that feet. Sutter was 25-13-11 (25-24) when he took over the Kings. But this is a sport which its storied franchise is the Montreal Canadiens. Montreal hasn't won a championship since Jacques Demers was coach and Patrick Roy was the goaltender in 1993. The Canadiens finished in last place in the Northeast Division with a 31-35-16, and 78 points, translating to an actual 31-51 mark. It may be awhile before Montreal wins Championship No.25. Rival Toronto finished two points ahead of Montreal with 80, posting a 35-37-10 mark which is actually 35-47. Montreal's record was the worst in the Eastern Conference and the third worst in the NHL. Only the Edmonton Oilers and Columbus Blue Jackets finished lower. Since Montreal's last Stanley Cup Championship, the following teams have won titles: New York Rangers, New Jersey Devils, Colorado Avalanche, Detroit Red Wings, Dallas Stars, Tampa Bay Lightning, Carolina Hurricanes, Anaheim Ducks, Chicago Blackhawks, Pittsburgh Penguins and Boston Bruins. Now the Los Angeles Kings. Ex Canadiens have figured in these teams success. Former Montreal Coach Scotty Bowman piloted Detroit to three titles. Roy won a championship in Denver before Broncos legend John Elway won a Super Bowl in the Mile High City. I wouldn't classify Colorado, Dallas, Tampa Bay, Carolina and Anaheim as hockey hotbeads. Nor will I consider Los Angeles as a Hockey Town. But I will say the Kings are champions and they won their title without Hall of Fame players Wayne Gretzky and Marcel Dionne, albeit with an under .500 mark. With the parity in the NHL, don't be surprised if the Blues, Coyotes, Florida Panthers or Nashville Predators are in the finals. Nashville's task got much tougher as the smaller market club lost many key players due to free agency. If Montreal or Toronto get to the Stanley Cup Finals, then the ratings could be a good boom for NBC across North America. NBC may not like it, but "Only In Hockey" can a points standings set-up produce such intrigue as we've seen year in and year out. But, I guarantee you one thing. There will be NO ASTERISK next to the LA Kings title. They made history for all of the most unique reasons. Now we'll see if new NHLPA Donald Fehr lets them defend their title. In 1994, under Fehr's leadership, the World Series was canclled for the first time in baseball history. In 2004, the NHL's Tampa Bay Lightning held their title for two years, but the second year it collected dust since there was no regular season. My message to hockey fans is Fear the Fehr because the Stanley Cup Trophy could be residing in Hollywood, CA longer than a year. Enjoy It LA! You won it the hard way by being full fledged road warriors. There will be one face missing at the FAU Football Opener on August 31 for the first time since 2003. Craig Angelos won’t be in attendance when the Owls face Wagner College. He was fired as Athletic Director on March 21, 2012 from his position where he earned $192,000. The main reason he was let go was utilizing his fund-raising, thus there was a lack of money. Add to the fact that FAU failed to sellout its Oct 15 opener at the new stadium, in addition to fewer than 4000 showed up at the final football game of a 1-11 season, and it’s safe to see that Angelos will watch future Owls games on TV. On July 2, the Owls decided to go to Big Ten Country to hire Angelos replacement. Now the challenge of fundraising falls on the hands of 37-year old Patrick Chun. He has spent the past 15-years in numerous roles with the Ohio State Buckeyes. He worked in endowment building, strategic planning, management, and leadership. Ohio State University (OSU) provides services for more than 1000 student athletes, 36 intercollegiate athletic programs, 100 coaches and more than 330 full-time athletic department staff in 15 facilities. The Ohio State athletics operating budget is in excess of $126 million. Chun’s colleagues gave him strong endorsements. OSU Associate Vice President/ Athletic Director Gene Smith, Clark Kellogg who is CBS Sports College Basketball lead analyst/ Vice President of Indiana Pacers, Football Coach Urban Meyer, Basketball Coach Thad Matta, Former Football Coach Jim Tressel, who is the current Vice President of Strategic Engagement at the University of Akron, Dutch Baughman, Executive Director of Division I A Athletic Directors Association and Joseph R Castiglione, Vice President of Intercollegiate Athletics at the University of Oklahoma. During the past year, the FAU Athletic Program has experienced numerous changes. In May, Women's Basketball hired Kellie Lewis-Jay, 36, spent five years at the University of Nebraska where she coordinated the Cornhuskers recruiting efforts. Lewis-Jay becomes the fourth head coach in FAU’s 28-year existence. Current Football Coach Carl Pelini, was an Assistant Coach for Nebraska last year, so the road from Lincoln to Boca Raton has filled two coaching vacancies, plus it could lead to games in the field with FAU facing Nebraska in women’s hoops along with football. FAU is scheduled to travel to Nebraska on August 30, 2014 and face the Cornhuskers. Don’t be surprised to see FAU face the Ohio State Buckeyes football team in the future with the automatic connection between Chun and the Buckeyes. Sports has been a part of my life ever since I was a little boy and being raised in Detroit, MI., I’ve been fortunate enough to have grown up in a town with four major teams. Watching my father play softball in Oak Park and later open up a sporting goods store named All Pro Sporting Goods in the same town was just the beginning of a passion. Thanks to his involvement, as a youngster, I was fortunate enough to have played baseball for six years, basketball and hockey each one season. Being a youngster, I always enjoyed watching these games and my Aunt Tina Caplan was an inspiration to pursue a dream as a Play-By-Play announcer. I would turn the volume off and do the Red Wings play-by-play. I idolized Tigers legendary announcer Ernie Harwell and Red Wings great Bruce Martyn. I’d go to Tigers games alone and did play-by-play in the bleachers at Tiger Stadium. But the transformation from being a fan to getting involved in the media began in 1979 when Sam Greenblatt, who was the manager of my father’s sporting good store. used to be a frequent guest on WXYZ’s Sports Talk with Ron Cameron. 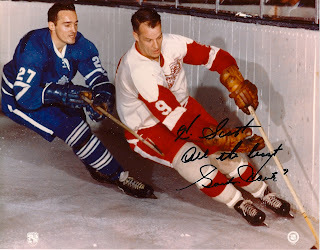 Sam and Ron used to discuss amateur hockey which was huge in Michigan. My father and Sam asked me if I wanted to visit the station and watch the show in person. Naturally, I jumped at the opportunity. The star of this show turned out to be my best friend George Eichorn. We formed an incredible bond that has now lasted 30 years and our work with the Detroit Monitor has led to unbelievable memories together. Both of us are members of the Detroit Sports Broadcasters Association. We’ve covered the Detroit Pistons, Lions, Red Wings and Tigers. This has allowed me to create other friendships as well including one with Harwell and the late Joe Falls of the Detroit News and Free Press. While it would take me forever to list all the great sports assignments, some which stand out are three Super Bowls, the Final Game at Tiger Stadium in 1999, the NBA Finals, 1984 USFL Championship Game, Spring Training, numerous Auto Races at Michigan International Speedway, Phoenix International Raceway, Miami/Homstead Speedway, an NHL All-Star Game, a few Orange Bowls in addition to writing about the Lions during the Barry Sanders era and the Detroit Pistons “Bad Boys” Championship Years. When Eichorn and I pursued other radio opportunities together and I moved to Florida to do remote reports, the 1981 Lynda Carter Maybelline Tennis Tournament in Deerfield Beach, and Baseball Winter Meetings in Hollywood, began a new journey in my sports career. My first major interview was with Tom Lasorda of the World Champion LA Dodgers. Former New York Daily News Columnist Phil Pepe helped me prepare for it. My late uncle Fred Cullen gave me the time off from his roofing company to cover this event at the Diplomat Hotel. In Florida, Eichorn introduced me to Tony DeMarco. Early in my journalism career, DeMarco took me under his wing and was a big mentor. DeMarco worked for the Hollywood Sun Tattler and the Miami Herald. In addition to radio, I have been affiliated with the following organizations. I was Sports Editor for the Broward Community College South, Pembroke Pines, Fla., “The New Horizons” for three years. I worked at the Hallandale Digest, Tampa Tribune, Reds Vue Magazine in Cincinnati, Ohio, and currently work with the Deerfield Beach Observer. In 1984, the same year the Tigers won the World Series against the San Diego Padres, I won an award for Best Sports Reporter for Junior College Newspapers. My adviser Betty Owen informed me in Tampa. At the Digest, I worked with one of the greatest people I’ve ever known in Peter Bluesten. Peter was more than an employer; he was a father figure, mentor, who was loved by all those whom he came in contact with. When I couldn’t go back home to Detroit, Peter treated me as family and invited me for Thanksgiving Dinner as well as other holidays. He supported all of my educational endeavors and we can all hope to meet a man of his caliber. If there were more Bluesten’s in todays “work force,” employee loyalty would be much higher because he treated everybody as family! My first editor at the Deerfield Beach Observer Ric Green created a position to cover Florida Atlantic University and I’ve been reunited with former Miami Hurricanes Coach Howard Schnellenberger. If FAU’s academic program had been further developed, I might have been an Owls alumnus in 1986. Instead I graduated from the University of South Florida in Tampa and had a blast covering sports events for the Tribune. The photos which will be posted on here are just proud memories of the great people I’ve come in contact with. The purpose of this Blog is to write about subjects which I have passion for. I’m not here to sensationalize or slander individuals reputations. Back in 1982 another former colleague named Andy Liscano, who worked for NBC’s Channel 7 in Miami taught me two valuable things. First, work as hard as you can and out work your opponent or competition. Second, always be different. The things we took pride in at Channel 7 is since our sports cast was before the competition, we worked harder to find different story lines by being creative. I repeat different story lines! That’s my goal here in this Blog is to take far fetched ideas and make you readers think and perhaps learn something. Liscano’s philosophy would enable him to get promoted to the No. 2 media market in the country Los Angeles and he was one of the main reporters for the 1984 Olympics. While I don’t expect everybody to agree with everything I say, I certainly encourage any feedback and will reply back ASAP. Your ideas are welcome. Things you might want to know and how it all began.